An oasis in the centre of Sandton, The Maslow Hotel is a four-star business hotel with a difference, adept at helping you to balance work and life. When it’s time for work, The Maslow Hotel is focused on business and when it’s time to play, you’ll find everything you need when you need it most. The hotel offers you more than an exceptional location and modern design. It’s an environment where you can reach your full potential by having the facilities and technologyin place to conduct business. This is where you can expect to have the best sleep and the best shower in Sandton. With every effort made to provide the most luxurious and technologically advanced meeting place, The Maslow Hotel is raising the bar for quality and value and redefining what it means to host a successful conference or meeting. The spacious facilities can accommodate events for up to 650 people, and the 12 separate meeting rooms and the Incubator provide the perfect business retreat for seminars, management meetings, training events or workshops. The meeting rooms are set in quiet landscaped gardens offering a place where you can unwind, stretch your legs and simply get to know your colleagues. Each room has its own butler, who will attend to your every need. The Lacuna Bistro and Bar is a sophisticated urban bistro serving international cuisine. The executive chef, Dallas Orr, ensures that only the best local produce is used in his mouth-watering menu. Interconnected and integrated with the outdoors, the Lacuna Bistro and Bar provides areas for impromptu gatherings or business meetings. The Lacuna Bar serves local and international draught and bottled beer. A select South African wine list and exotic, specialty cocktails mixed by the resident mixologist makes this a fine place to enjoy a drink either inside the bar or outside on the terrace. The delicious high street food is easily accessible and affordable. At the heart of the lobby is the signature Wayfarer Lounge, a business-class-type lounge that has been designed to enable guests to be totally productive while waiting to check in or before departure to the airport. Facilities include washrooms with showers, complimentary Wi-Fi and a supply of power sockets, should guests need to recharge phones and laptops. Every attention has been given to physical comfort. The 281 bedrooms and suites ooze elegance, yet still provide the functionality that business tourists look for. They come with everything you need including extra-length queen beds. There’s free coffee and tea, a media hub so you can listen to your music or watch movies, and you can stay connected with free Wi-Fi. 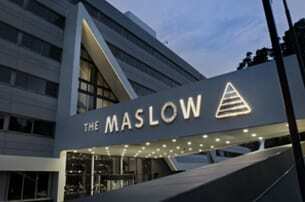 The Maslow Hotel’s focus is on service excellence and quality conferencing and with its close proximity to the Gautrain Station, top investment banks, financial institutions and the Johannesburg Stock Exchange,it’s the venue of choice for your next event..